While the popularity of mobile devices and tablets has been increasing, UW-Madison students are not using them as anticipated. Additionally, they (along with faculty and staff) want and expect more in terms of features, applications, and availability than ever before. And they are satisfied with the services they receive at UW-Madison. These and other findings come from the 2013 Computing Surveys conducted by UW-Madison’s Division of Information Technology (DoIT). The yearly surveys track students’, faculty and staff use of and satisfaction with UW computing services and technologies, as well as specifics regarding wireless, printing services, the My UW-Madison portal, trends in technology usage, and more. DoIT then analyzes the results to better serve the needs of campus. Highlights from the survey follow. 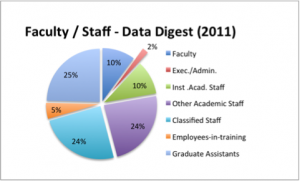 220 faculty and staff took the 2013 DoIT Computing Survey. 238 students also took the computing survey. 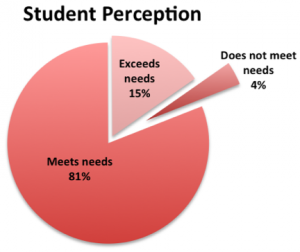 Ninety-six percent of students surveyed said that their technology needs are met (or exceeded) on campus, while 84% of faculty and staff said their needs are met (or exceeded). In both groups, the DoIT Tech Store, DoIT Help Desk, Software Training, and DoIT Repair and Departmental Support were ranked highest. 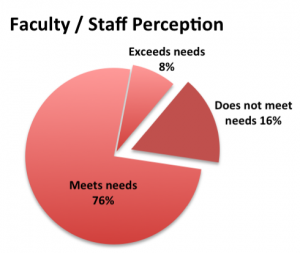 There is a definite difference between faculty and staff in terms of their perception of their technology needs being met on campus. In short, student respondents are much more favorable (and feel like their needs are being met) than faculty and staff. There is also a SLIGHT difference among Mac and PC users in satisfaction. Student Mac users are slightly more satisfied than PC users, while Fac/Staff PC users are slightly more satisfied than Mac users. Respondents were asked to provide feedback regarding wireless access. Of the faculty and staff, 74% were satisfied. 92% of students are satisfied. 40% of students noted that they use printers in the general access labs. Those who don’t use the printers most commonly cited the following reasons: lack of need, access to personal printer, access to free printing on campus, and cost. Those who do use the printers most commonly noted: they don’t have a printer at home, it’s easier than getting ink, it’s less expensive than my personal printer. 63.4% of surveyed students and 42.3% of faculty find the campus maps in Mobile UW useful. 62.2% of surveyed students and 40.5% of faculty and staff find the bus schedule in Mobile UW useful. Students who live in on-campus housing are most likely to use Mobile UW tools. Over 50% of students indicate that they use My UW, the Campus Map, the Bus Schedule, and the Library tool. Over 50% of those who reside on campus use those tools as well as News and Athletics. 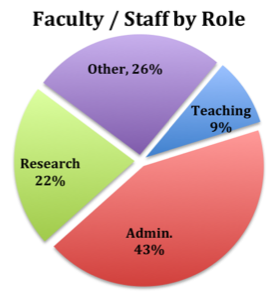 Among faculty and staff, 55% of those who indicated that teaching was their primary task use the campus map tool. When asked what could be done to improve Mobile UW, the most common student response was to increase awareness of the app, followed by enhanced bus route planning/bus tracking, increased integration with Learn@UW, MyUW and other services, more platform availability (Windows, Blackberry) and increased app stability. Faculty and Staff also mentioned a lack of awareness, need for more robust bus tracking and increased stability. To this, faculty and staff included praise for the real-time parking feature. UW students are setting aside their desktop computers in favor of smaller, more portable computing options, however, they’re not using them in the way we thought. In June of 2013 Gartner and eMarketer estimated the overall percentage of tablet users in the U.S. (relative to the population) at 23.7% — with an approximate breakdown of 42.7% using iOS (iPad) and 57.3% using a non-iOS tablet. Among faculty and staff respondents at UW-Madison, the percentage who are tablet users, such as iPad, Galaxy Tab, and Nexus, is 42.6% — with an approximate breakdown of 46.8% using an iOS (iPad) and 53.2% using a non-iOS tablet. Student respondents at UW-Madison are more in line with national trends. The percentage who are tablet users is 27.8% — with an approximate breakdown of 37.1% using an iOS (iPad) and 62.9% using a non-iOS tablet. Additionally, nearly all students (99%) use a laptop computer for personal use or schoolwork. Eighty-eight percent use a mobile device, such as iPhone, BlackBerry, Android, Windows Phone, and iPod touch — up from 67% in 2012 and 56% in 2011. However, students do not see tablets as a tool for schoolwork. Only 58.3% of student respondents who own tablets indicated that they use them for schoolwork (40.0% iOS tablet users, 34.9% Windows and Android tablet users). Faculty need to be aware that just more than a quarter of students own a tablet device. Additionally, those who do own a tablet device do not see or expect to use it for schoolwork. The annual UW-Madison computing surveys were delivered via email in spring 2013 using a random sample of 1,200 UW-Madison undergraduate, graduate, professional, and special students and a random sample of 1,200 faculty and staff (researchers, administrators, teaching). Response rates were 20% for students and 18% for faculty and staff.